What is the Georgia Council on Developmental Disabilities (GCDD)? Does GCDD provide services to people with disabilities and their families? Who are members of GCDD and how are they selected? With what organizations does GCDD partner? What are examples of collaboration among the DD Network partners? What is GCDD’s role with public policy? How does GCDD decide on its legislative agenda? How can I support GCDD and its efforts to influence public policy? What does GCDD do to advocate? What is “UNLOCK" (formerly Unlock the Waiting Lists!)? What kind of programs does GCDD support? What can GCDD do for people with disabilities or their families? What are the Real Communities Partnerships? What are the REAL areas that GCDD refers to and how is that different from the Real Communities Partnerships? How can I subscribe to the Making a Difference magazine? Q. What is the Georgia Council on Developmental Disabilities (GCDD)? The Georgia Council on Developmental Disabilities (GCDD) is a federally funded independent state agency that promotes and creates opportunities to enable persons with disabilities to live, work, play and worship as an integral part of society. We accomplish this through three primary areas of focus: public policy, advocacy and program funding and implementation. Through collaboration with citizens, policymakers, public and private advocacy organizations, we work to promote increased independence, inclusion, integration, productivity and self-determination for persons with developmental disabilities. Our efforts include public policy research, analysis, and promotion, project demonstration, education, training, and dissemination of accurate public information. Q. What is a developmental disability? A developmental disability is a severe, chronic, mental and/or physical disability which occurs before age 22 and is expected to last a lifetime. 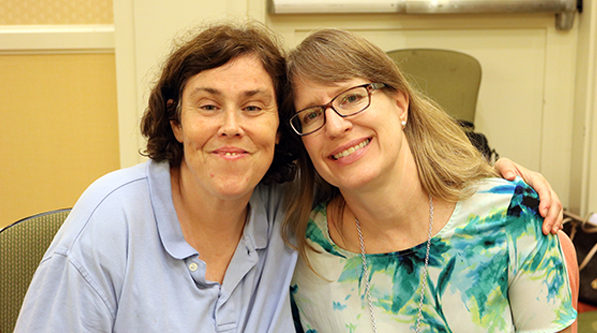 People with developmental disabilities will require supports in three or more of the following life activities: self-care, language, learning, mobility, self-direction, independent living and economic self-sufficiency. Q. When was GCDD established? The Georgia Council on Developmental Disabilities is one of 55 Developmental Disabilities Councils established across the country and its territories under the Developmental Disabilities Assistance and Bill of Rights Act of 1971 and authorized under the federal law, PL 106-402 (2000 Amendment). Originally, and according to state legislation, GCDD was created as the “Governor’s Council on Developmental Disabilities.” GCDD’s name was changed in July 2009 to the “Georgia Council on Developmental Disabilities,” in accordance with legislation that ordered the reorganization of the Department of Human Resources (DHR). This is the same legislation that established the new Department of Behavioral Health and Developmental Disabilities. GCDD is attached to the Department of Behavioral Health and Developmental Disabilities (DBHDD) for administrative purposes only. Since its inception in 1971, GCDD has been a leading resource for public information, advocacy, and public policy efforts. The Georgia Council on Developmental Disabilities is leading the nation in its Real Communities Initiative to guide, support, join and build inclusive and welcoming communities across the state. Q. Does GCDD provide services to people with disabilities and their families? GCDD does not provide direct services to persons with developmental disabilities, as federal funds from the Administration on Developmental Disabilities are not allowed to be used for that purpose. However, the Georgia Council on Developmental Disabilities collaborates with agencies, individuals, parents and advocates to support families and persons living with developmental disabilities by promoting good public policies and creating innovative projects. In addition, GCDD assists individuals with disabilities and their families with sharing their stories and making sure their voices are heard. Q. What does GCDD do? Our work is based on three areas of focus: public policy, advocacy and program funding and implementation. The Council and GCDD staff promotes activities and creates opportunities that enable people with developmental disabilities to exercise their rights to live, learn, work, play and worship in the place and manner of their choice. GCDD often uses its resources to commission research on policy issues and to fund model programs. GCDD funds projects to inform decision makers, legislators and the general public about developmental disabilities. There are many efforts made to advocate and educate the various audiences about critical issues affecting people with disabilities through publications such as Making a Difference Magazine, Public Policy for the People legislative newsletter, and events such as Advocacy Days at the Capitol and Take Your Legislator to Work Day. Q. Who are members of the Georgia Council on Developmental Disabilities and how are they selected? GCDD is governed by a 27-member board, known as “The Council.” They are appointed by the Governor and comprised of at least 60 percent individuals with developmental disabilities and/or family members. Other members include policymakers that represent various agencies and organizations having responsibilities in serving and supporting people with developmental disabilities. For a current list of Council members and advisory members, please click here. Click here to download the application to become a member of the Georgia Council on Developmental Disabilities. These appointments are made by the Governor and there is no set time frame for when they are made. Q. What organizations does GCDD partner with? The Georgia Advocacy Office (GAO) – A non-profit organization located in Decatur, Ga. Its mission is to work with and for oppressed and vulnerable individuals who are labeled as disabled or mentally ill to secure their protection and advocacy. The Institute on Human Development and Disability (IHDD) – A University Center of Excellence in Developmental Disabilities located at the University of Georgia in Athens. IHDD helps people with disabilities enhance their quality life and achieve their highest capacities. The Center for Leadership in Disability – A University Center of Excellence in Developmental Disabilities located at Georgia State University in Atlanta. Its mission is to translate research into sustainable community practices that contribute to independent, self-determined, inclusive and productive lives for individuals with developmental disabilities. Q. What are examples of collaboration among the DD Network partners? The Safe Schools Initiative is a collaboration of the Georgia Council on Developmental Disabilities, Georgia Advocacy Office, Center for Leadership in Disability, Institute on Human Development and Disability and Parent to Parent of Georgia. The ultimate goal is to shift the culture of Georgia public schools so that all students have the right to receive an appropriate education in a safe environment that enhances learning. The coalition encourages the use of positive behavior supports and works to ensure that all students shall be free of restraint and seclusion in schools. The joint effort hosted focus groups around the state, organized a press conference, produced materials that explained the proposed rule from the state Department of Education, populated a website with pertinent information, sent out action alerts to families and advocates, provided information on positive behavior supports, encouraged a letter writing campaign, and gathered stories from families related to this topic. The Children’s Freedom Initiative has been an on-going collaboration between the DD Network partners. The goal of this effort is to get children out of state institutions or nursing homes and into permanent loving homes. The work has included obtaining a resolution through the legislature, production of a booklet of stories, assistance in person centered planning for some of these young people, facilitation of a study tour for families and people with disabilities to see their options. Q. What is GCDD’s role with public policy? Monitor and make recommendations for the state budget on home and community-based services impacting people with developmental disabilities. Keep legislators informed on the challenges families face in caring for their loved ones with disabilities. Assist families in telling their own stories to their legislators. Q. How does GCDD decide on its legislative agenda? Issues must directly or indirectly affect people with developmental disabilities or GCDD itself. The issue must align with GCDD's mission, vision and values. Our organization has the knowledge and expertise to represent the issue. There is the capability of developing a realistic plan for how to implement the policy position, communicate the plan to the appropriate people, and make use of the position in our work. After there is consensus on which items they want to include on the legislative agenda, the Council members rank the items in a tiered system. If the issue is something that GCDD needs to take the lead on, the item is a tier1. If the issue is something GCDD needs to support, but some other organization is taking the lead, the item is a tier 2. If the issue is something GCDD is willing to support by lending their name, the item is a tier 3. If GCDD needs to remain neutral and not take a stand, the item is a tier 4. If GCDD needs to oppose the issue, the item is a tier 5. The legislative agenda is posted on our website following GCDD’s October meeting. The agenda is a working plan that is used to guide and direct GCDD’s time and resources during the legislative session. If an unexpected issue pops up during the legislative session, the executive committee is consulted and provides guidance on how to respond. Q. How can I support GCDD and its efforts to influence public policy? GCDD sends out a legislative e-newsletter every week of the session called Public Policy for the People. You can also advocate by calling your local legislator to share your personal story and advocate for issues on which the Council is working. You can find a comprehensive list of state and county legislators and contacts in Congress, the Senate and the House. For more information on GCDD public policy efforts, contact Dawn Alford, Public Policy Director at . Q. What does GCDD do to advocate? GCDD hosts Advocacy Days at the Capitol each year during the legislative session to let people with disabilities, their families and other stakeholders meet legislators and discuss what is important to them. Take Your Legislator to Work Day (TYLTWD), hosted by Employment First Georgia (EFG) and supported by the Georgia Council on Developmental Disabilities (GCDD) to raise awareness about the benefits of hiring individuals with disabilities and the belief that employment and successful careers should be the expected and preferred outcomes of all publicly funded services for individuals with disabilities, i.e., Employment First. GCDD leads an advocacy campaign called “UNLOCK" (formerly Unlock the Waiting Lists!) to reduce or eliminate waiting lists for home and community-based services. As of July 2010, 5,011 people in the community are waiting for home and community-based services. Q. What is “UNLOCK" (formerly Unlock the Waiting Lists!)? increase the allocations of funds targeted for home and community-based services. More than 100 organizations have signed onto the campaign. You can sign up to receive action alerts by clicking here: http://www.unlockthewaitinglists.com/join.html. Q. What kind of programs does GCDD support? GCDD has two ways to help fund learning opportunities or projects that improve the lives of people with disabilities: The Partnership Fund is a GCDD resource that awards small grants (not to exceed $2500) to help individuals with disabilities and/or family members attend learning events or conferences. All awards are made as reimbursements; funds can not be made available before the event. Please note that no individual, group, or organization may receive partnership funds in successive years. Applications are available by clicking here. Completed applications should be emailed to Sharon Strandberg at least 30 days before the event. Any questions may also be sent to Lisa Eaves via email at . Recipients must keep their receipts for documenting their expenditures. Innovative Grants are small, renewable grants for unique projects that help people with developmental disabilities overcome barriers to participating inclusively in aspects of life related to careers, homes, learning, supports, and influence. The ultimate outcome of Innovative Grants is to promote policies, system change, and capacity building activities that improve the quality of life for Georgians with developmental disabilities. Applications are accepted for projects on October 1st and April 1st. Learn more about Innovative Grants here. Q. What are the REAL COMMUNITIES Partnerships? Real Communities Partnerships were launched statewide in 2010 by the Georgia Council on Developmental Disabilities (GCDD) to partner with local groups working to build more than just communities. It's a thoughtful, action learning approach that equips community members at the local, grassroots level to work together toward common goals to improve their community using person-centered supports, community-centered connections and persistent and reflective learning. Purposefully involving people with and without developmental disabilities in collaborative projects is pivotal to the framework of Real Communities. Please visit the “Real Communities” section of our website to learn more. Q. What are the REAL areas that GCDD refers to and how is that different from the REAL COMMUNITIES PARTNERSHIPS? GCDD organized its activities and projects in their last 5-year plan (2007-2011) focusing on areas that people with disabilities said were important to their ability and the opportunities to live successfully in the community: homes, careers, learning, supports and influence. These are the REAL areas which support the REAL COMMUNITIES umbrella. Our work in the REAL areas has included the following: Real Careers – technical assistance in customized employment, including work around an Employment First Policy, and replication of Project Search. Real Homes – housing coalition building, including a project called Easy Living Homes; pursuing buy-in from the Home Builder’s Association for more universal design; and promotion of visitability in home designs; seeking representation and a voice for disability advocates at the planning table for the Beltline Project; and promoting financial literacy and IDA accounts to help people become homeowners. Real Learning – promotion of teaching self determination in high schools and middle schools; Partners Clubs; research on the special education funding formula and diploma options; facilitating student-led IEPs; development of post- secondary learning options; and attention to transition issues through a statewide transition committee Real Influence – GCDD publications such as Making a Difference Magazine, Moving Forward Newsletter and annual reports; public policy work done through the legislative process; special events such as Disability Day at the Capitol, Discovery Day, and the annual Making a Difference Awards Ceremony; media coverage such as radio and television interviews, press conferences, newspaper coverage, media roundtables; development of DVDs; and support of selfadvocates to be leaders. Real Supports – family support through establishment of navigator teams at the county level; development and expansion of a Direct Support Professional Certificate Program and the Georgia Alliance of Direct Support Professionals; support for Unlock the Waiting List! Campaign; and formation of the Georgia Micro-board Association. Q. How can I subscribe to Making a Difference magazine? Making a Difference magazine is published quarterly. It is a quality publication that addresses topics of interest to the disability community. Click here to subscribe. View our archives here.